what's a top down tour? visiting music city and don’t know where to begin? overwhelmed with choices of where to go, what to do and where to eat? 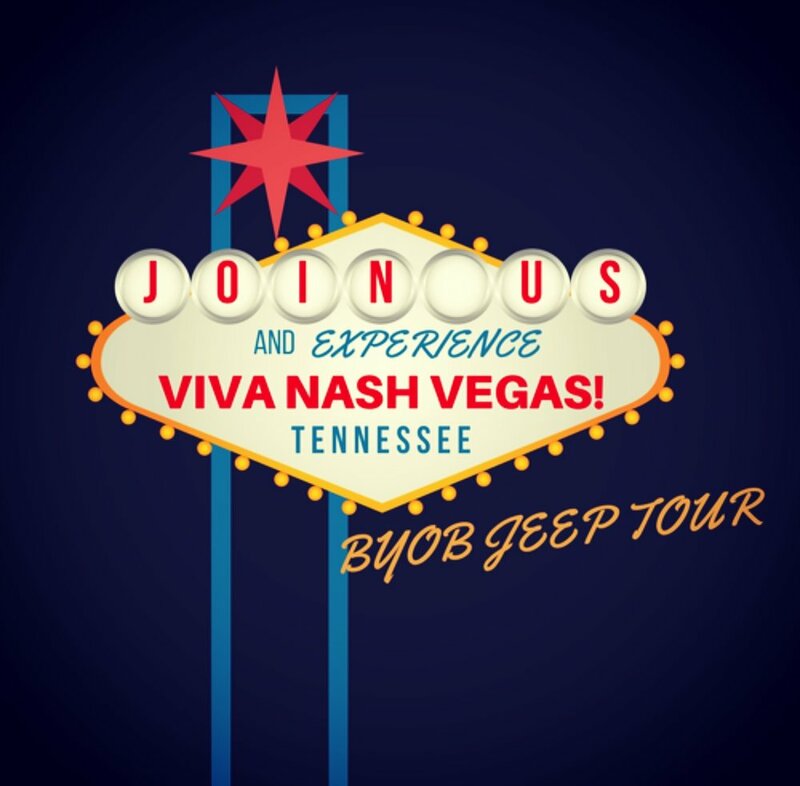 let a local tourism expert help you discover your nashville while cruising in a jeep! 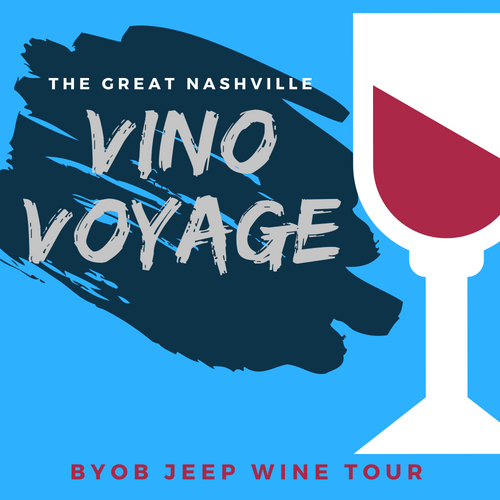 Named one of the "Top 15 Things You Must Do in Nashville" by TravelPulse, our award-winning BYOB tours are great for couples, convention attendees, bachelorette parties, groups of friends, and anyone looking to experience the real Nashville and hear the real stories. Themed tours include stops at some of our favorite local bars and restaurants, hot chicken joints, murals, and iconic Nashville attractions such as Historic RCA Studio B and The Bluebird Cafe. Our tour guides are all experienced tourism professionals who want to get to know your travel style and personal interests. After your tour, they’ll even send you a list of curated activities, restaurants and attractions based on your one-on-one conversations! Choose your theme, show up with your drinks, hop in, and get ready to discover your Nashville. We operate year-round. All tours are private unless otherwise stated. 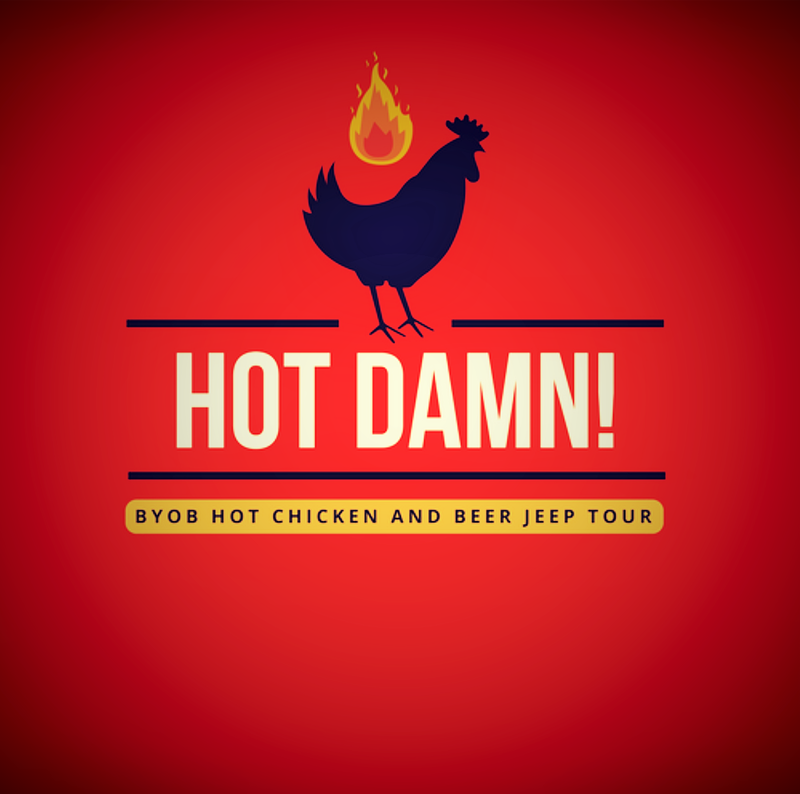 WHY SHOULD you BOOK a TOP DOWN TOUR? Consider us your Mobile Concierge. You want to tour Nashville beyond just Broadway. You want a private tour experience. You want a tour guide who is a tourism professional and who will engage with you. You want a free list of things to do that’s based on your interests. You want someone to take photos during your tour so you don’t have to work on your vacation. Because cruising down Broadway with the top down and the tunes on is a BLAST! questions? we are here to help! text us at 615-779-6227 for quick answers. How about a tour of Nashville in a Jeep Wrangler? Everything in the Jeep is customized to your liking. Prefer the top up? Windows down? No problem. Listen to our curated playlist or crank your own tunes, it’s up to you! Plastic cups and a cooler with ice are provided. Let’s roll, y’all! Tour Nashville while riding in a tiki bar on wheels! Our customized Cruiser van features a retractable top, kitschy lights, colorful leis, Hawaiian decor and themed photo props. Plastic cups and a cooler with ice are provided. Aloha! This is our most popular option. This experience takes you through downtown, Music Row, 12South and the Gulch, all while playing drinking games and turning up the tunes. We’ll stop at bars and take pictures at the most popular murals so you don’t have to! This is a great way to see the city. Nashville is known for its Hot Chicken. Join us and find out why! You’ll go to two of Music City's best hot chicken eateries for cold beer and great food. We’ll also cruise through cool neighborhoods and take pictures at popular murals. So, try it for yourself. Your taste buds will thank you! Get ready for your four-hour wine tour. Arrington Vineyards is a stunning property outside Nashville. Owned by country superstar Kix Brooks, it is one of the most beautiful attractions in Middle Tennessee. You’ll do a wine tasting then stroll through the hillside vineyard to take photos. 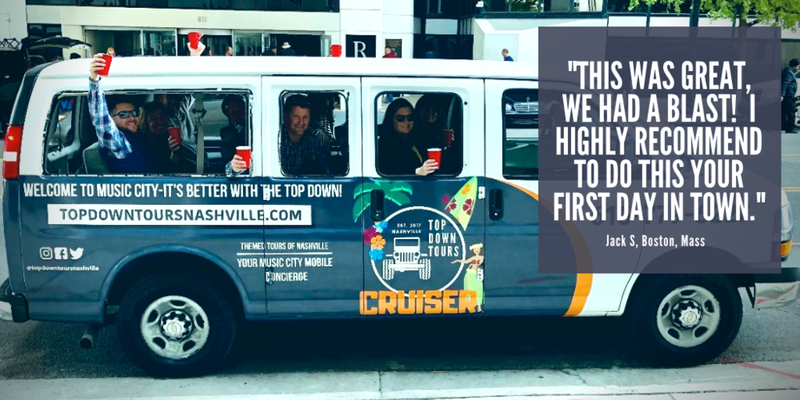 Your Top Down Tour travels all over Downtown, Music Row, the Gulch, 12South, East Nashville and much more! receive VIP treatment and fantastic discounts at all of our partner locations!